What is a hot air fryer? Is the air fryer good for you? Questions which no doubt you would like answered before you decide on buying the hot air frying machine. 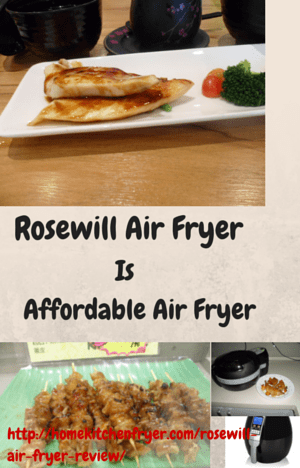 Reading through this digital Rosewill air fryer review will let you have a better understanding of how this low fat healthy air fryer works as well as its benefits and whether it is the best air fryer for you. 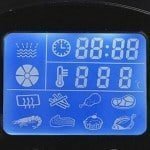 1.1 Air fryer technology – How does the low fat air fryer works? 1.3 What can you cook in the air fryer? 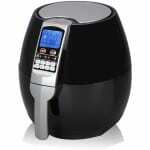 It is considered an affordable cheap air fryer when compared to the rest of the air fryers available in the market. It is about the same price as the Avalon hot air fryer. Is the Rosewill fryer losing out in other features or accessories due to the much lower price? A huge $200 difference is a lot when compared to the Philips digital air fryer or the $80 difference of the Tefal Actifry. Air fryer technology – How does the low fat air fryer works? 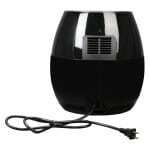 The Rosewill healthy air fryer comes fitted with a heating element to heat the air and a fan to blow the hot air around. Both are located in the top section of the appliance. It cooks food by making use of the extremely fast moving heated air that strikes the food in all directions. Because of this rapidly moving air, the food gets to be cooked evenly and fast. This hot rapid air circulation technology ensures precise and fast cooking with very minimum oil used. In fact, certain food such as the precooked frozen food stuff need no additional oil added at all. Unlike the deep fryer whereby food is cooked by the high heat of the oil, the food in the air fryer is cooked by the high heat of rapidly moving air. Resulting air fried food leaves no greasy aftertaste in your mouth. The Rosewill hot air fryer comes with a 2.6 quartz capacity cooking basket. The food to be cooked is placed on the wire mesh cooking basket and the excess oil drips down onto the non-stick drip tray on which the basket sits. You can release the basket from the drip pan by pressing the basket release button on the handle. The basket can hold about 300 – 700 gm. of frozen fries at one go. You can cook about 800 gms. of potato wedges or 500 gms. of steak in the 2.6 Q basket. With the Rosewill hot air fryer, you can fry, grill, bake or roast your favorite food. On top of that, most cooking is finished within half an hour. 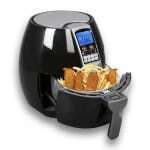 It is a very versatile low fat multi cooker. Thick frozen fries take about 10 – 20 minutes and thin frozen ones need about 10 – 15 minutes at the maximum temperature of 400 degrees Fahrenheit. Resulting fries have less fat compared to deep fried fries. Just imagined the amount of oil ingested when deep fried and especially if these are part of your daily diet. You can use this Rosewill low fat healthy air fryer to cook a complete meal for lunch or dinner, snacks for tea or grilled sandwiches for breakfast. Main beneficial point is that the resulting food is low in fat. A piece of steak weighing 500 grams take about 12 minutes at 360 degrees F.
500 gms of drumsticks can be cooked or air fried under 25 minutes at 360 degrees. You’ll be surprised at the amount of oil that dripped onto the drip pan. This is pure chicken fat dripped out from the fat content in the chicken meat. 20 minutes at 400 degrees will get you fried fish for dinner. However, do not expect the food to taste like those deep fried in a large amount of oil. Close but not exact. You can still get a slight crunch on your chicken skin but unlike those deep fried with a crunchy batter. The meat does taste moist and not dry. If you end up with meat that is too dry, then you need to lower the temperature or shorten the cooking time. A lot depends on the size of your meat. Deep fried food with wet batter might not turn out well in the air fryer. However, there are some customers commenting about their successful battered food cooked in the air fryer. Adding a bit of oil to the batter helps to get a crispier texture. Baking a small cake is as simple as putting the cake mixture in a cake pan that fits within the basket and then pressing the preset cake program. It comes with a default timer of 30 minutes and a temperature of 330 degrees. The appliance comes with 8 preset cooking programs. Picture images or icons of the 8 preset programs make it easy to choose the program for the particular food you’re cooking. The programs include Warm-up, Chips, Chicken, Steak, Shrimp, Meat, Cake, and Fish. These preset programs are easy to use as the timer and temperature have already been adjusted. That said, you can still change the time or temperature if you wish for a different time and temperature. This can be easily done by pressing the timer and temperature button. There are 2 control buttons to set if you do not wish to use the preset programs, the timer and temperature control. The timer can be adjusted to a maximum of 30 minutes with 1 minute increment adjustment. Majority of food cooks within 30 minutes. Temperature ranges from between 170 – 400 degrees Fahrenheit and can be adjusted with a 10 degree increment. There is the start/pause button and a cancel button. Pressing the cancel button will stop the timer. All these settings are clearly visible on the LCD display. The fryer looks simple enough to use. The trick is in getting the best temperature and cooking time for your food size and portion. You might need a few testings to get the right results. Smaller pieces of food will need a shorter cooking time and lower temperature compared to bigger size cuts of the same food. The air fryer stops cooking when basket is removed to give the food a shaking. Cooking continues when basket is inserted back inside the fryer. When timer reaches zero, there is a beeping sound, 5 times to be exact. Cooking stops and machine goes into standby mode. This prevents overcooking and burning of food or even worse, starting a fire. The handle stays cool during the cooking process. There is double protection circuits. Always make sure there is a 4″ clearance all around the fryer. When reheating food, set the temperature to the maximum of 400 degrees and a time of 10 minutes. Fried food reheats very well and still retains the crispy texture. The 2.6 Q wire mesh basket sits on the non-stick drip tray. The air fryer comes with a 45″ power cord. 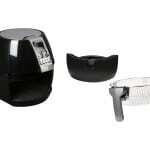 There are no Rosewill air fryer accessories such as those from the Philips air fryer. You can use other brands accessories as long as these can fit into the cooking basket of the Rosewill air fryer. If you are tired of cleaning up the mess after deep frying, then hot air frying is the way to go. If cooking low fat healthy meals for your family is top priority, then the low fat hot air fryer is for you. Less fat, less calories in your favorite fried food is most appealing. If you’re always busy on the go, you will appreciate the ease-of-use and quick cooking of the fryer. Just put your food ingredients into the machine, press the buttons, go about your other chores and in less than 30 minutes, your meal is ready. You can cook with the minimum of fuss when using the hot air cooker. Cleaning up is hassle-free as all removable parts are dishwasher safe. Some customers commented about food stuck in the mesh basket and how they solve the problem by putting the food on aluminum foil before cooking. There are not that many customers’ reviews on the Rosewill air fryer as the product is still very new. The main benefit seems to be the less oil needed advantage as well as the less fat in the cooked food appeal. And what is equally important is that the taste of the food is still good. One customer even commented about the food tasting better as the spices used are well absorbed during the cooking process. The digital Rosewill air fryer is affordable when compared to the more expensive Philips digital airfryer ( a huge $200 difference) or the Tefal Actifry (about $80 difference). Rosewill hot air frying cooker has a preset cooking program (8 menus) for a quick start while the Philips and T fal models do not have this feature.